Digital print on Moab Entrada, paint and puzzle pieces, 24in x 18in x 1.5in. Phyllis Ewen’s sculptural drawings explore the fast-changing phenomenon of global warming, highlighting the effects of rising waters and parched earth. 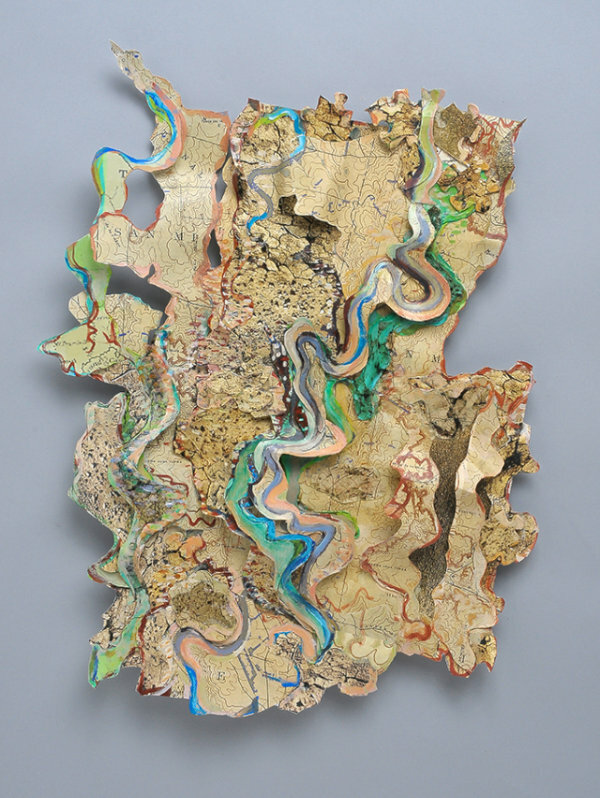 Ewen builds three-dimensional topographies through layering, altering and reshaping archival paper, adding paint to create transformed land and seascapes. Each piece consists of scanned maps, charts, and digitally printed photographs. Handmade jigsaw fragments further articulate the three-dimensional surface and ripple throughout the compositions. Ewen looks at issues of fertility and drought, abundance and scarcity, turbulence and quiet. She explores ways in which our imagination and memory interact with our altered natural world.